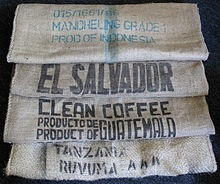 Burlap is a woven, rough cloth, made from jute, hemp, or other fiber. It is often found woven into sacks, and used to carry bags of food and other medium-weight objects. This is also known as Hessian Cloth. Wikimedia Commons has media related to Hessian (cloth). This page was last changed on 22 July 2014, at 18:10.